Chances are, you’ve been preparing for this opportunity your whole life. Owning a FasTracKids Learning Academy offers you the opportunity – and the tools – to apply your teaching experience (not required), your love for children and/or your business talents in a satisfying way and get paid to do it. Operating your FasTracKids Enrichment Center is similar to operating other retail, service-oriented businesses. Your primary customers are parents while the consumers of your services are children. Marketing your business relies on referrals, social media and excellent customer/consumer care. 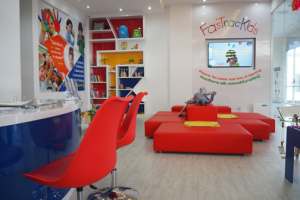 Our franchisees tell us that both parents and children LOVE their FasTracKids experiences. Through our franchise system, you will receive 11 programs that enable you to build relationships with children as young as 6-months all the way up through 8 years of age. Since 1998, schools and and early childhood education programs worldwide have set themselves apart by integrating FasTracKids programs as a value-added offering to their students and parents. Our innovative, technology-based curriculum teaches the way children learn naturally – collaboratively and through a multi-sensory approach. 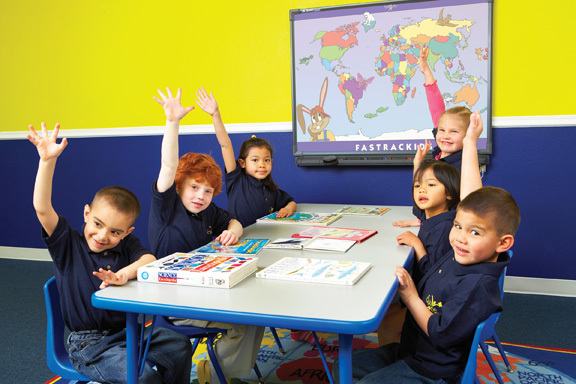 Our specially-designed programs come to life on the FasTrack Learning Station (interactive whiteboard) and are fun for kids to learn and teachers to teach. All of FasTracKids weaves together important educational philosophies from experts such as Jean Piaget, Eric Jensen, Howard Gardner, Benjamin Bloom and Reggio Emilia in its programs. Further, outside research demonstrates the measurable effectiveness of the programs. You can be sure that when you offer FasTracKids programs as part of your curriculum, your students will enjoy the experience AND gain the skills they need for academic success. Fill out the Contact Us form to the right or use the information found below.